This is a unique Canadian tutoring system which can support your child throughout primary school. It is interactive and fun. Kids just love to use it. 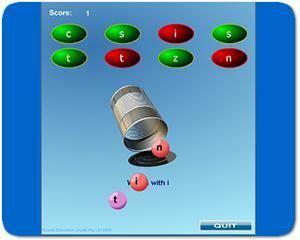 "Phonics Challenge" is a word game which teaches how to blend three sounds together to make a word. The voice reads the letter sounds and the word and the child picks out the letters on the phonics keyboard. The keys make the sound of the letter. Suitable three letter words are randomly generated. Your children can learn gradually, at their own pace, through practice and exploration of the ideas introduced in the lessons. How do you know whether a child is taking in the meaning of what they are reading? In English Wiz, we make the sentences interactive - the student has to drag and drop a part of a sentence or word, to make it fit in with the meaning. So they really do have to think about what they are reading.